-Disposable|Heroes- • View topic - So what else are you playing? So what else are you playing? Post subject: Re: So what else are you playing? But onward, final fantasy 3 (jobs to unlock and hidden jewels of light to find im sure) or neverwinter nights2 next, I'm on a game-beating spree. Tried fable II some more, I want to like it, but I just dont so far.. I dont care if some wench will marry me and have kids if I whistle at her 19 times. I liked DQ4. It was simple, but I grew attached to the characters. Skip FF3 Day, go straight for FFIV. It'll keep your interest a lot more than FF3 will. I cant, ff3 is the only numbered ff game I havent played (and only one i havent finished along with ffx-2), i gotta put at least 20 hours into it, get my $20 bucks worth. ff2 (origins) was complete crap too but I pushed my way through it just because, I cant imagine 3 is as bad as that game.. where you had no levels, could easily manipulate the exp/power up system, and magic was all but pointless since it did such low dmg. FF3 isn’t terrible by any means, it's decent, but nothing spectacular that's for sure. I just find the game's age shows heavily in the story and game content. I never really understood the hate most people have for FFX-2, the battle system was fantastic. I guess I don't see the problem folks had with the story either. If you gave the game an honest chance, the story is actually very touching, and I'll admit I got a little misty at one particular point, just like at the very end of FFX. All-in-all, I'd say go for both for completions sake, but you may not be all that impressed with FF3. me playing an online FPS game, just thought this was funny so I started recording. Game usually doesn't have that many hackers and most of the time they aren't so obvious in using them >_>...doesn't really bother me that much I usually do leave the match if there is a hacker in it but this was my last match for my next promotion and I didn't want desertion points. For anyone that hasn't played the game, Gremio dies. I recently found out that there was a way to resurrect him. Which basically involves getting all 108 stars before the final battle. Got Bionic Commando yesterday and beat it today. I love that game, but the ending is kind of interesting. It shares similarities to the movie Soylent Green. It's people. His Bionic arm is made out of people!! Lol Denruki is that Combat Arms? A game's online free-ness is proportionate to the amount of haxors. 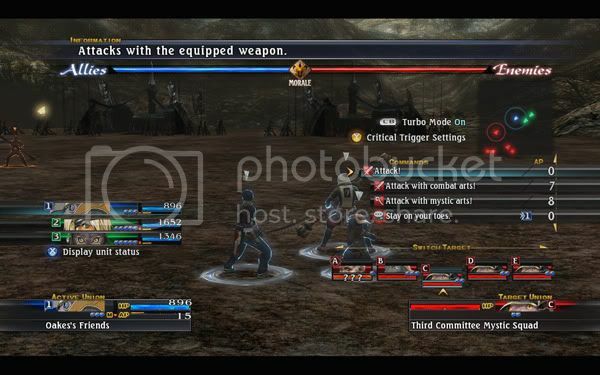 I have been playing some "The Last Remnant" lately, it's pretty decent. The battlesystem is a bit confusing at times and also SE was too lazy to remove the "Xbox keys" on pc version, so I had to look in the manual what keys to use instead for some movements lol.